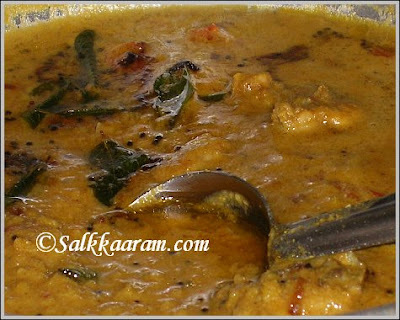 Chicken dal Curry / Kozhi Parippu Koottan | Simple and Delicious ! 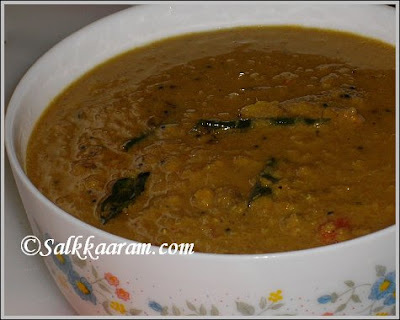 I couldn't believe that chicken can be prepared with dal until I see this recipe. When I got it from some old magazine clippings, I had no expectation that I could prepare a good chicken curry with that. I changed the recipe according to my taste since I had no hope, it was only an experiment, but the outcome was really wonderful! I found this is a best accompaniment with ghee rice..
Roast the first set of ingredients (chopped shallots, garlic and grated coconut) in little coconut oil, when the coconut turns brown, add the remaining ingredients. (cardamom, cloves, cinnamon, fennel seeds and black pepper). Stir for few seconds.Allow to cool. Blend it to a fine paste,using enough water. Wash and clean chicken and dal.Cook them together in water with all the powders and salt. If you use tuar dal (I haven't tried with that yet) first cook it until half done and then add chicken to it. When this is 1/2 cooked add the crushed ginger and shallots. Mash chopped tomato with your hand and add it too.Cook until done. Pour the blended coconut spices mixture into this and bring to boil. When bubbles appears on top and the gravy becomes thick, remove from fire. Heat coconut oil. Splutter mustard seeds, roast curry leaves and chopped shallots and pour to the curry. 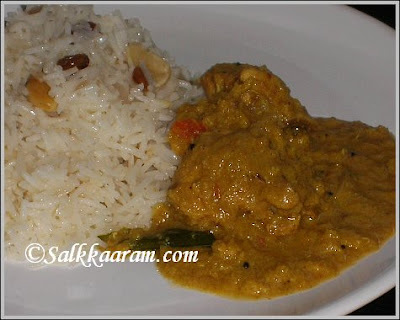 Enjoy with ghee rice, chapathi or as you desired.. This looks wonderfu I love the thick gravy yummy! Chicken and lentils sounds so delicious. I have emailed you Seena, did you not get them? this combo...quite rare....should try soon! This curry looks so tasty :) Hope u re feeling better! that looks lovely!! and nutritious too! I never tried my dal with chicken. This combination look unique and tempting to try. This looks really good! And a great pic...my mouth is watering just looking at the pic! I have a Ramadan food Event posted on my blog. Would you be interested in participating. Sounds new but looks great Seena! Hope you and your family are better..Dhal in chicken...something to try!!! This recipe always stuck in my head for some reason, maybe because it seemed like an odd combination or something that could be made quickly because all the ingredients are on hand.... I made this yesterday and it was a hit!! My dad said maybe this can be made to accompany "piddi". This recipe is a keeper - thanks so much for sharing!!! Also - your quantities are so precise and correct - never goes wrong to follow your recipes!! My wonderful boyfriend just made this recipe and it might be the most delicious meal I've ever had! Thank you so much!